OBSERVATION POST SHRINE, Afghanistan – Somewhere on the edge of Taliban country, we’ll be spending the night amidst the sound of coyotes, crickets and Afghan music. Photographer James Lee and I reached this small outpost in Kajaki district today, and will be staying with members of 1st Battalion, 8th Marines, out of Camp Lejeune, N.C. An element from 1/8’s 2nd Platoon, Alpha Company, calls “The Shrine” home. They are tasked with partnering with soldiers from the Afghan National Army to keep insurgent fighters in the countryside from coming closer to the landmark Kajaki Dam and civilians in the nearby area. It’s commanded by 2nd Lt. Jeff Lenar. The outpost sits on one of Kajaki’s many rocky hills, overlooking a network of compounds, fields and dirt roads. To the north is Zamindawar, a section of Kajaki that is a known Taliban stronghold. U.S. forces have launched multiple raids on Zamindawar this spring, but with a drawdown of forces underway in Afghanistan, it isn’t expected that coalition forces will establish a fulltime security presence there. Instead, they’re relying on disruptive operations in which Marines land, shake up local enemy fighters, gather intelligence and return to their bases. For that reason, OP Shrine is key. It has been the site of more firefights in the last few months than any other part of Kajaki district, Marines say. In most recent cases, insurgents target the OP at long distances, typically at least 1,000 meters – but they frequently disappear into a series of tunnels in Zamindawar known as “karezes,” said Staff Sgt. Matthew Hutchenson, 2nd Platoon’s platoon sergeant. 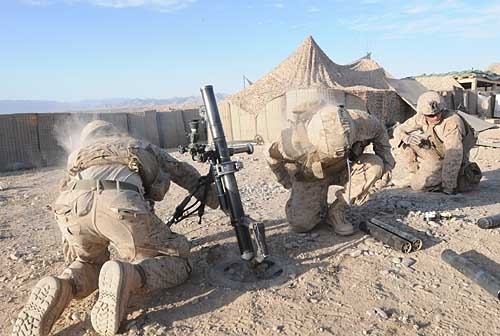 Lee and I watched tonight as Marines adjusted and fired their 60mm mortar tubes, “registering” them. Beyond that, it’s been relatively quiet here so far.